Nyssa Abroad | Blogging? It's a doddle! Welcome to a world of Food and Fashion! What more can a girl want? Blogging? It's a doddle! Welcome to a world of Food and Fashion! What more can a girl want? To say British television is any worse than American is unfair. But to say that even bad American television makes more sense than British….isn’t completely off. I’m going to start with some commercials. Unfortunately I can’t embed this one, so hopefully it will work outside the UK. This is a Cadbury Commercial. When it first came on, we didn’t know what to make of it. It was a bit awkward. It starts out well. And then just take a turn for the …um… no? The look on the mom’s face is pretty good though. Next is Jonathan Creek. Oh…how the mighty have fallen! I was so excited to see him in a new mystery. The clever magician is the ridiculously obscure situations that are seemly unconnected that’re miraculously explained. Well… There was a mystery. It was explained. And it was a terrible ball of rubbish! I’ve included it for the enjoyment of others, but I have to admit, I was very disappointed. And to think I skipped Broadchurch for it! Then there’s those little things that you enjoy in shows like the IT crowd, but then you find out where the joke came from and it’s that much better. This happened today when I was watching mindless game shows…and Countdown came on! All that was in my head was, “It’s REAL!” I was going to post a clip from the actual show… but there’s apparently a need for sexualization of the letter card woman, Rachel Riley. Guess nerds need somethin’. If you’re curious, you can look it up yourself, but I don’t want some of those titles linked to my page! However, back to commercials, Virgin Media is just down right amusing. David Tennant being the spokesman kinda helps, but they are just silly! There’s also one involving him basically just sitting and eating popcorn. Lastly, I’m just going to end with a little bit of random Red Nose Day. Accents are an obvious thing to expect abroad. You think the English will sound like Downton Abbey, you assume it to be a fact. And, in some cases, it is. But there are some random words that you’d expect to be totally different that are actually the same, or just downright strange. Firstly I became aware of the tones in which the English speak. This is kind of hard to share over a blog, but it really is different. You can “put on” an English accent, but if you don’t get those pitches right, you won’t sound “British.” They prolong certain sounds, and move their pitches much more than Americans do. I can’t think more on how to explain it…so I’m going to suggest the next time you watch a British show, really listen for those fluctuation. Once you notice, there’s no going back. But of course the next thing you notice is words. They use different vocabulary for basically everything. Trying to have a basic conversation with a middle school child can be difficult because they don’t know what you mean by “d’ya” or “how’re’ya doin’.” You try and find Tylenol, but they don’t sell it in the UK, it’s called something TOTALLY different, but they still sell Ibuprofen. I take Zyrtec allergy medicine back home, but all I could find was Zirtek. But then…food even gets a little weird. 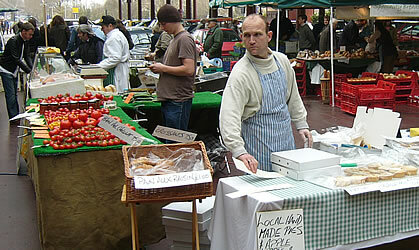 Take for example the produce stand that comes to Bath every Monday, Wednesday, and Friday. (This is not it pictured above. The one above is from the Saturday market at Sainsbury’s.) They’ll say Tomato as I do, To-may-toe, but they say Potato as Po-tah-toe. Why? They’re like, basically the same word. They don’t seem keen on the ‘mah’ sound that you might expect someone English to say in Tomato. And then there’s Bananas…. They’re a whole ‘nother bowl of fruit. Now this pronunciation is just weird. Think first, how you say Banana. Now think, I say Banana as Bah-nan-ah. You’d expect an English person to say Bah-nah-nah…however, that is not quite right. They do, in fact, pronounce it as Bah-nah-ner. Yep. With a “ner” at the end. “Bananers for sale! Bowl for a pound!” That’s what I hear on Wednesdays. But it’s not only Banana that suffers this strange oratory fate. It’s really any word that ends in an A. The name Emma is usually said Emmer. Idea becomes Idear. Oddly enough, my name has yet to suffer this peculiarity. I still remain Nyssa, though I feel it’s a matter of time before I become Nysser…that will be a sad day. It just baffles me. Why? 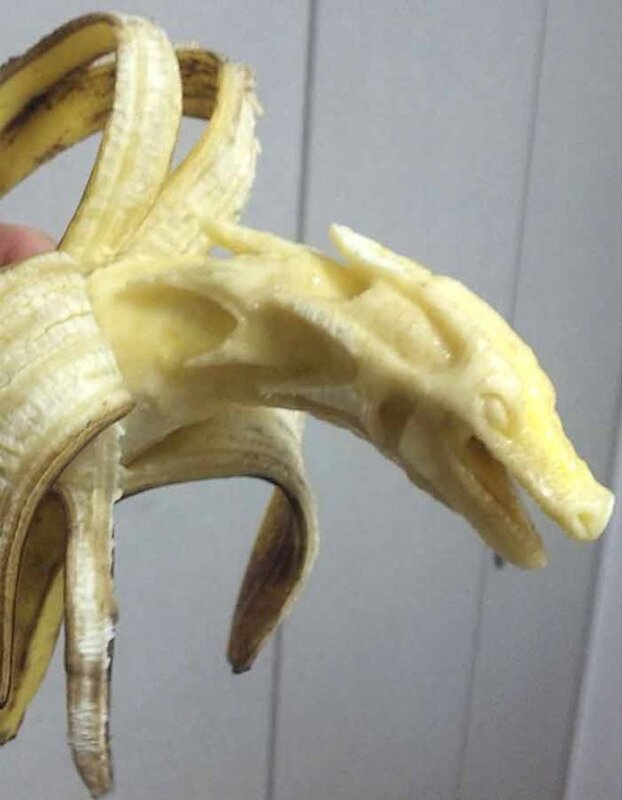 There’s no R in Banana! All television is, in some sense, mindless. It’s nice to sit down with some reading and have the discovery of Richard III’s body on in the background. Or to have a wonderfully drab documentary that tells you all the dirty secrets of an old well-to-do family. Or maybe Time Team is uncovering what they thought to be a Roman villa, but it’s really a Roman village! But then there’s that other part of the television. The part you forget about, like, actors are real people. When they’re not in a movie or a show, they’re in commercials. And not only are they in commercials, they’re in really annoying commercials that come on in high rotation. It’s like… you think of an actor, that you’re pretty sure you couldn’t not like, and then do something horrible to them, and you begin to wonder. But, everyone has to make a living! It doesn’t mean I don’t dread this commercial (and it’s two other variants) coming on every break during my quaint little documentary! Some (few but far between) are as entertaining as surprising to see someone you recognize! It’s nice to get a reprieve from the shocking anti-smoking and don’t text-and-drive commercials that would not pass on American television. While I do agree with the messages, and think it probably is more effective to be that blunt, I’d much rather dwell on such commercials as this one. But familiar faces pop up in other places as well. Like, hosts of fun shows like Top Gear. Like Hammond. Who could dislike him? Well, I still don’t, but I can never see him in the same light after he hosted the most ridiculous Ninja-Warrior-esque game show, Total Whipeout…I think. I don’t know where the British come up with this stuff. Honest. I can’t even remember who won, or what they get for winning. All I know is, everyone failed every level (except that one where they jump from little pillars onto the big spinning one, but even then it was whoever five get there first). The point was, whoever failed the fastest and go to the end…right? Or were they suppose to succeed in their endeavors? And then there’s the real television shows, the dramas. The series were you follow your favorite actor as they take on the role of a damaged, young detective in a small town. I’m waiting for the cinematography to get a little less melodramatic, but by the end I was into it. Broadchurch isn’t normally something I’d tune into, but with David Tennant as the lead and Arthur Darvill as the village vicar, how could I not at least give it a try? The plot is a child is found dead on the beach in a small, quiet village. No one knows why. A troubled detective, new to the area, is put on the case with a local woman (who was expecting to get his job) as his partner. Despite the humorous first 60 seconds, the mood was dark very quickly. Tennant plays the scruffy cop well, but Arthur Darvill was only introduced fleetingly in the first episode. We’ll see how the next one continues next Monday at 9pm on ITV. Too bad I’ll be in Oxford! I wonder if they’ll have a telly? If there’s one thing people tend to think of when thinking of England, it’s probably the English Garden. Undoubtedly, England is full of gardens. It may be a secret little alcove in the basement of a city flat, or it might be a vast garden over acres of land like something in a movie, but I guarantee there’s more gardens than you think should be able to fit. Pictured above is one such garden I visited, Stourhead. 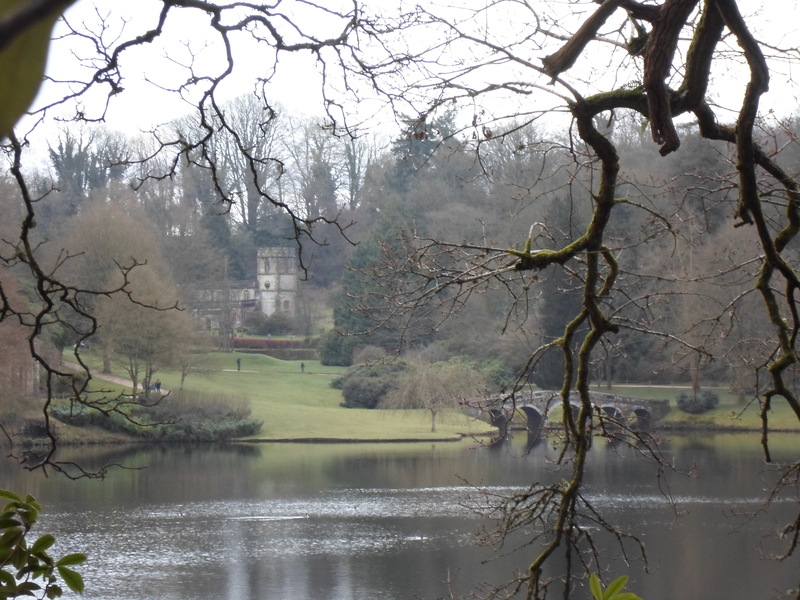 Stourhead is a wonderful and vast garden with an enormous lake in the center, and a tiny village at the end. Owned now by the National Trust, it was owned and built by a banking family. Much of the garden is Grecian with highlights such as the Temple of Apollo (featured in Pride and Prejudice, the first proposal from Darcy), and the Grottoes featuring statues of nymphs and Neptune. Going to such a vast garden as this makes me wonder. Did the family often walk the whole garden on fair days? It took us nearly an hour and a half to make our way through the whole garden. If I had owned it, I think I’d have done nothing else but walk the grounds, have romantic rendezvous in the dark grottoes, hide from storms in the witch’s cottage, and admire the hills from the lonely island in the lake. How different then, you think, is London? The capital of the nation. Well, it is completely different, actually. While the Queen still has her private garden hidden from the public eye, you’d think London didn’t have much room for gardens. London blurs the line of what we would call Gardens and what we’d call Parks. Kensington Gardens was a nice reprieve from the GO.EVERYWHERE.NOW.AS.FAST.AS.YOU.CAN of London. Full of surprisingly well-trained dogs, and a serious lack of plants, it seemed more like a vast park. 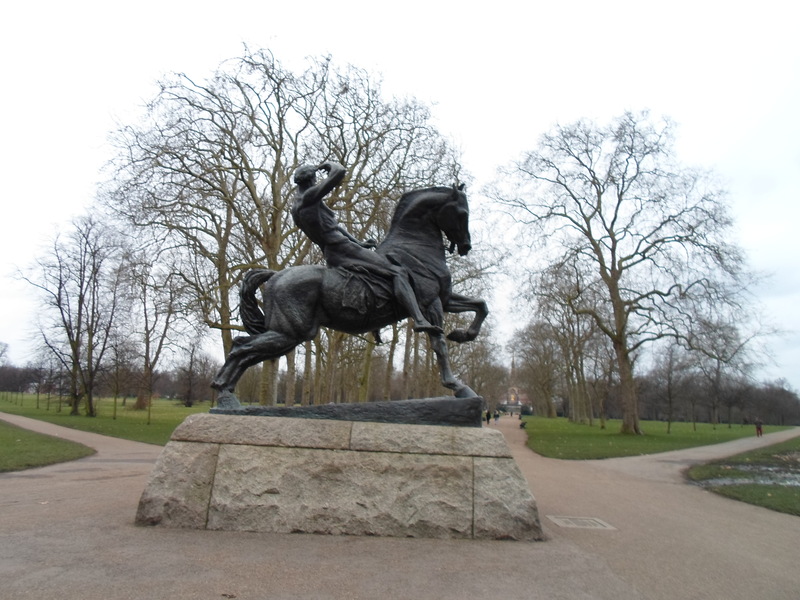 Kensington Gardens is separated from Hyde Park by a small river and features the infamous Peter Pan statue. While a change from the city, I think this park is much nicer for sitting and picnicking than strolling through on a cold, snowy day. What fascinates me about England most, I think, isn’t how they incorporate greenery into their busy cities, but instead how they keep history and scenery open to everyone, even through private estates. They do this through a thing called Byways. They are basically footpaths honored by law for respectful, public use. 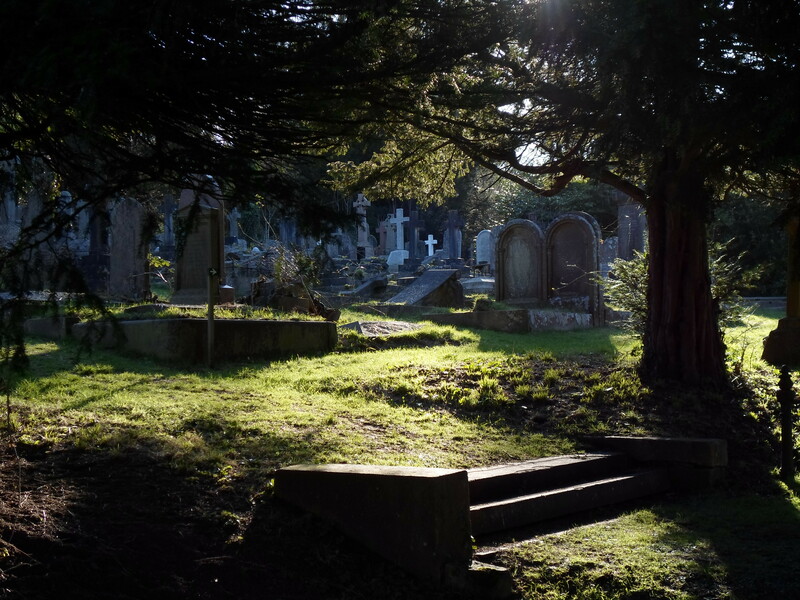 Bath has a couple of these nearby, one of which includes the Bath Abbey Cemetery on its route. Positively the oldest cemetery I have personally been in, I found it to be eerie and peaceful. We entered through the gate and found our way along the soft ground to the center walkway. On either side were headstones nearly as tall as I am, some taller. A small chapel sat center at the end of the cemetery. It was interesting to see how ivy was beginning to take over some stones, while some stones were practically new (1980s). But up in the corner, if you walked to the side of the chapel, there was a small paper map in a plastic covering. The map said that this was part of a Byway, and people were permitted to take the path (through the cemetery and the small woods to the side) up to the Prior Park Estate. In essence, England, I feel, is set up in a way that almost the entirety of the country could be visited on foot. We took a school trip to a piece of the Cotswolds. The Cotswolds is kind of like a mountain chain…or as close as England really gets to mountains. But it’s a series of Byways that stretch together and lead from Bath across a comparatively vast region. We walked from an old folly tower, through kissing gates, and across the grazing fields of sheep. There weren’t any sheep in our fields that day, but we saw plenty in the next field over. These paths are not for the unfit, though. Hiking is one thing, hiking through English mud is another. Thankfully, on the Cotswolds day it was so cold the ground was frozen (take your blessing where you can), though I still almost fell once! Now that I’ve had a taste for adventure, I decided to seek it out myself. 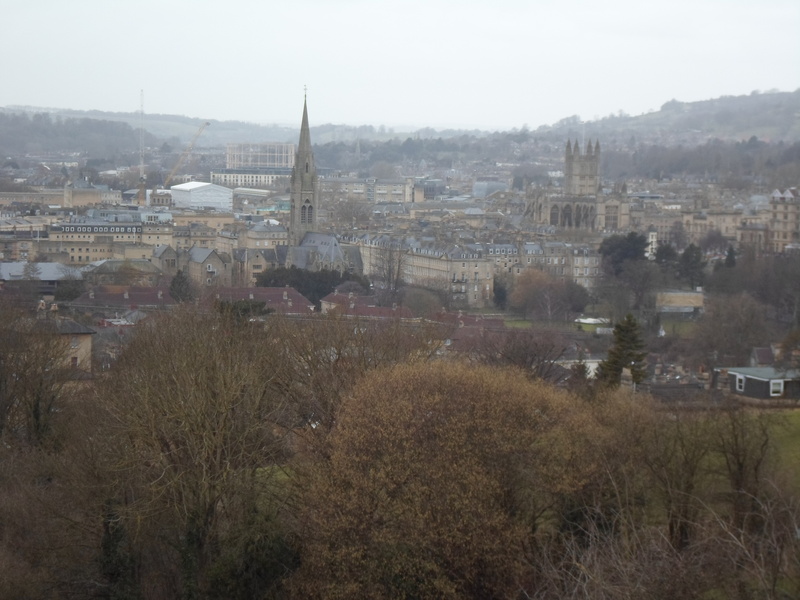 I’d heard of something called the Bath Skywalk that is a large circle Byway path that walks in the hills around bath, up to the folly castle, and offers amazing views of the city below. (That pointy spire is right next to my house!) So I set out on Friday up Widcome Hill, yes, UP Widcome Hill, in the curiosity of what was uphill from my house. I thought the hill could only go on for so long…I’m just still unsure of how long that so long is. I have yet to reach the top of Widcome Hill, but that’s another story. A very good ways up the hill, I ran into a kissing gate. I paused, and noticed it had one of those little papers, and on the other side, was a very big, colorful, official map. So I went in. I found myself in a fair field with clear marks of trekking. I took pictures of the map and set out to walk the Skywalk! And got promptly lost in the woods. After I lost the path in the woods, I started thinking… For being a Skywalk I wasn’t seeing much of the Bath city through the trees. So I opted to turn back, before I lost my converse in the natural spring swamp, and found my way back to my field. After admiring Bath for a time at the top of the field, I studied the map again for quite some time. The map, I decided, was not helpful in the least, but it seemed like the path went along Widcome Hill, not away from it, so I set out downhill, through another kissing gate, and eventually through a farm. By the end, I found myself lost somewhere near the center of the City of Bath. It was quite an adventure, and once I figured myself out, I bought myself a nice bacon and leek pastie from a local shop for my walk home. Next time, I will come prepared for a full 7 mile hike and attempt to do the whole Skywalk, and of course, find the folly castle. Who would guess that a first world country that speaks the same language would be so different? It doesn’t really hit you when you walk around town or use the bus. It hits you in the weirdest places at the weirdest times. The first time it really hit me was last Thursday when I had my initial visit to my school placement. At first it wasn’t a big deal, but it got me thinking a little bit. I was the only American there. All the other times I’d been out I’d been near other Americans, either ones I knew or tourists. That was the first time I’d been on my own in the real British world. In the end it wasn’t really a big deal, but I became aware of being the odd one out. On my way back I stopped and got a candy bar. Maybe it was because I was tired, or maybe it was just one of those times where he needed subtitles, but I could not understand the clerk. I felt really bad about it. I mean, we spoke the same language…I think. Anyway, moving on. I tried to not let it bother me much. Keeping myself busy, looking forward to Stonehenge and classes. Then I went to Boots, the drug store. I wanted a knee brace, vitamins, and pads…easy list, right? Well, it might have been, if the store wasn’t two stories. I went to the top to talk to a pharmacist, get my knee brace, which I finally found under first aid (makes sense). Then I found my fish oil vitamins, which are in this really weird bullet kind of bottle which all vitamins seem to come in. Then I could not find pads for the life of me. There were big signs everywhere saying “Please Pay Here” so I wasn’t even sure if I could go look downstairs or not without buying what I had! I eventually just asked a clerk, and she told me with a funny look on my face where to find “sanitary napkins” and I could just pay downstairs if I wanted. So I went downstairs and bought some pads. Turns out, British women apparently favor scented pads. They don’t come in normal, they come in smelly. We’ll see how this goes. Then we went back to the upper school for my teacher’s year 11, so 15ish years old. They were equally fascinated that I was American. One group even asked for me to help them solely for the purpose of hearing me talk. It was somewhat embarrassing! And I had to choose different phrases to see how they were doing with their work. “How’re you guys holdin’ up?” doesn’t translate well into British… It should continue to be an exciting adventure! I’ll continue to be the one with the “lovely accent,” the one that supposedly understands what “I’ma take out a piece and tap that” means (which doesn’t mean what I think the teacher meant), and the one from the glory land of romance, crime shows, and gangs all because I’m the American. Today we went to the vast and famous Stonehenge! You may not be able to walk among the stones, but you can get awfully close to them. It was a long and early bus ride to the attraction on which almost everyone fell asleep. But then everyone seemed to wake up around the same time as we thought we might be getting close. There were a number of burial mounds scattered across the fields of sheep. We passed some construction that seemed painfully out of place, but we figure it’s for a museum so it’s not all bad. Then suddenly, with no warning at all, the bus turns the corner and BAM. Giant stones in a circle. What they failed to warn everyone properly about was the weather. Blustery would be putting it lightly. The weather said about 8 degrees Celsius, so not a bad 47ish degrees out. However, it did not mention the windchill. Stonehenge is placed upon a hill with absolutely nothing around it but sheep. By the end of the circuit, which takes about 15 minutes to walk, all of our hands and faces were numb! Sadly the weather had turned something I wanted to stay at forever into somewhere I’d seen enough of for one day. But our adventures were not over! Back on the bus and off to Salisbury we went! 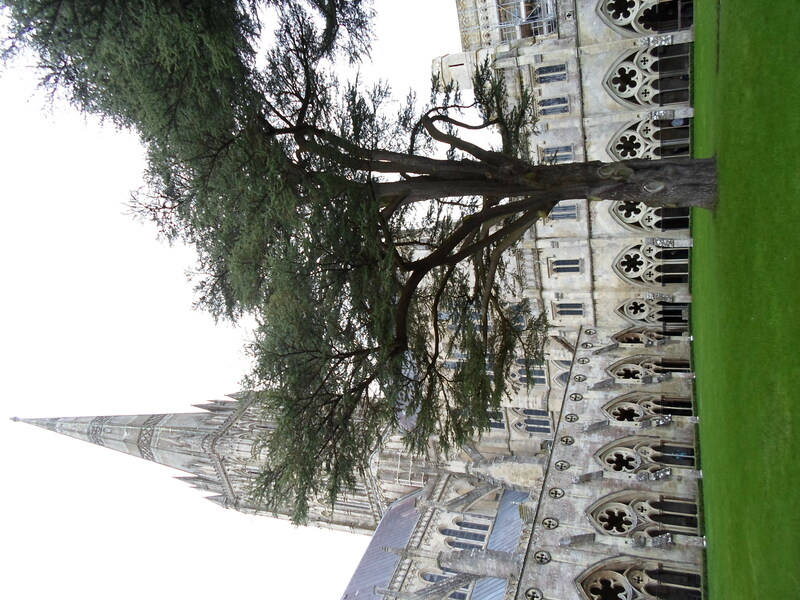 I opted to go on the optional tour of Salisbury Cathedral. The view was spectacular! The font just inside was the biggest I had ever seen. Made of black marble it took up the majority of the center aisle, which considering the size of these buildings was pretty impressive. Our tour guide was an amusing man and told us the story of William Longspee who was fighting in a war and was captured. No one knew what had happened to him for 6 months or so. This other guy’s nephew needed a wife. So he went to the missing man’s wife and said, “Hey, you’re pretty, and your hubby’s not coming back, marry my nephew.” To which she replied, “Naw mate, not in your life, I know my Billy’s coming home. Sod off.” And sure enough, William did return. To show no hard feelings were meant, William was invited to dinner by the other man, and found dead soon after of poisoning. Oh…England. On an interesting note, the same poison killed a rat that had found its way into his tomb some time later. Lastly, we got back on the bus and headed into Lacock. By this time it was dim enough my camera wasn’t particularly interested in working. It was twice as cold as Salisbury as well! But this village was the most charming. 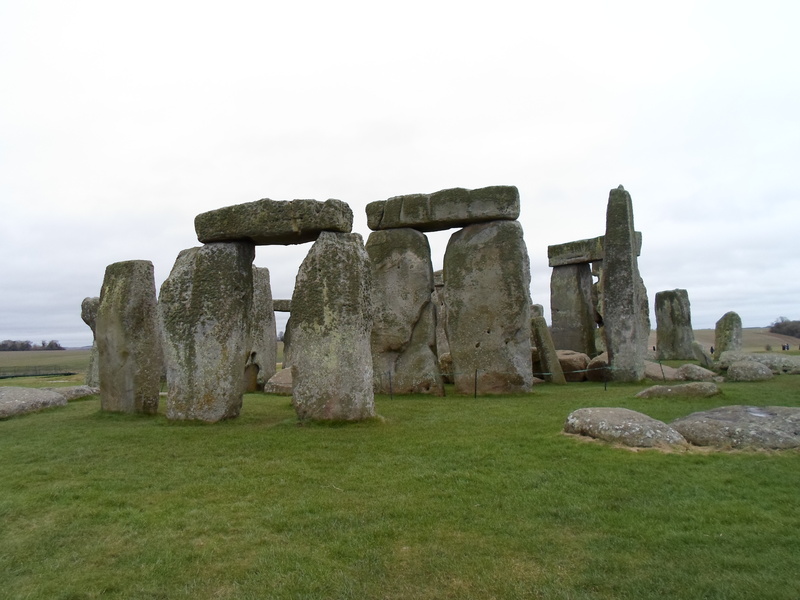 With about 350 inhabitants, it is a protected historical sight in England. New construction is more-or-less prohibited since William Longspee’s wife set up the Abbey. And what do you reackon about that building? Look kinda familiar? It’s probably because you’ve seen it in Harry Potter, Emma, Pride and Prejudice, or the 2010 Wolfman. 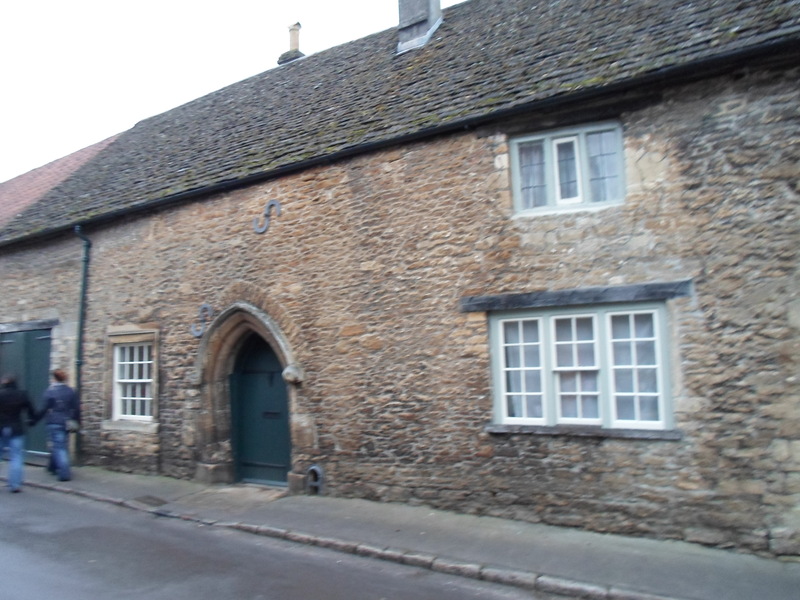 All of those and more were filmed in this tiny protected historical town of Lacock. We had dinner nearby in a little place called The George Inn build back in 12something I think. Stuffed chicken wrapped in ham with gravy, broccoli, and potatoes, and a sticky toffee pudding for dessert with a pint of the local ale on the side. Today was a busy, yet fulfilling day. I know I promised culture shock, but this was far more interesting! The Flight: Flying is uncomfortable. Flying with a head cold is worse. I guess, in a sense, it was a small blessing as I couldn’t taste the airline food very well. But joking aside, the flight was all right. 6.5 hours, over Canada then the ocean. The Sun had just come up by the time I got out of the plane…. 6.5 hours after it had just set. Didn’t sleep a wink! Soon it had been 24 hours since I’d slept! It was very exciting. Getting into Bath: That was tricky. It’s like driving in DC, but with worse parking, neighborhood streets only, and no way to understand traffic signals. Luckily my friend Tony was very good and found us the way to the train station. I couldn’t even recognize the symbol for rail! And did you know, they didn’t use the metric system until the last 30-40 years or so? So all the road signs are in Miles and cars run by Miles per Hour. But it’s illegal to sell anything in inches, pounds, onces, or gallons, etc. Once in Bath it was not so bad. We waited for the bus that would take us to our houses for about 2 hours. Once there though, it was really lovely. Charming little house with crooked steps. Downstairs is the kitchen and washer and dryer, a wooden dining room, and the access to the back garden. There’s also a full bath with the shower “right” next to the window. On the ground floor is the mudroom, a bedroom, and the living room with a TV and lots of couches. That is the room the photo I posted yesterday was taken. On the way to the “first” floor, on the landing, is a toilet. Then on the first floor are two bedrooms, one of which has a bathtub in it, and yes it is carpeted. Continue up to the top floor and there are two more bedrooms and a giant shower room with a tiny shower in it. No toilet. Only a tiny stand-up shower in the corner of the giant room. Oh, and the corner of my room is painted like a Jungle! The Weather: No one knows. Don’t listen to the forecast, it’s probably wrong, but might be right, so you don’t know. It might be 52 out, but the wind’s at 23mph. Or maybe it’s raining, well, it was, and it might later, but it’s stopped now. Oh, just kidding, there it goes again. But the Sun’s out? That’s hail. But all in all, it’s not bad, just very cold. Diagnostics! : We were told at the height of our jet lag that we’d have to take diagnostic tests. No one knew it was coming, but they reassured us that it won’t count against us. The teachers didn’t seem too horrified when we spoke to them at the reception, so here’s hoping! Classes start Monday with Education in England and Shakespeare in Performance for me. Then School placement on Tuesday. Culture shock will be in my next post! This is the view from my living room in Bath. Tonight it’s movie night! Tomorrow is a tour of the markets and Sunday Stonehendge! I’ll blog again when I have a little more time about the whole transition and the rest of my charming house!